A new year and a new blog that’s all about tea and us here at The Gilded Teapot. So welcome aboard! We’ll be keeping you updated on everything going on here – and boy do we have a lot planned! You can follow us right here on this blog, and also on Twitter and Facebook so you’ll always be in touch with what’s cooking here at the teapot. My family have always been big tea drinkers, and my Grandparents ran a hotel – my brother and I used to kick around in the kitchens during school holidays, and once we went to the Cash and Carry on their usual supply run (we loved riding on the big flatbed trollies). 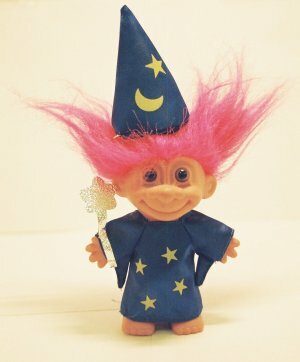 My Grandparents bought an industrial sack jam packed full of tea bags, and this particular one was having a giveaway – do you remember those dolls called Trolls? The ones with the hair? Well, there was one of these trolls in the tea sack, and one of the guys in the kitchen gave it to me. I must admit, I wasn’t really into the Trolls – I found them a bit scary to be honest, but I loved this one. Because this Troll was different – this Troll’s hair smelled of tea. So thank you, Trolls and thank you, tea.